I'm flying off to Churchill, Manitoba this weekend where I'll be searching for polar bears and other wildlife with Frontiers North Adventures. Yes, I've packed my cold weather gear, and am looking forward to seeing the beautiful bears up close. I've seen polar bears one other time in the wild, in Hudson Bay while on a Cruise North trip from Kuujjuaq, Quebec to Churchill. But I'm ready for more! I couldn't pass up the opportunity to spend a couple of extra nights in Winnipeg, a city that I've only visited once and calls me back for more. I was hoping to see the Winnipeg Jets return to their home ice after a 15-year absence, but they're on the road. But no worries, I love musicals (OK, more than hockey), and the Winnipeg Symphony Orchestra is presenting one of my favorite composers in Send in the Clowns: The Music of Stephen Sondheim Starring Len Cariou. 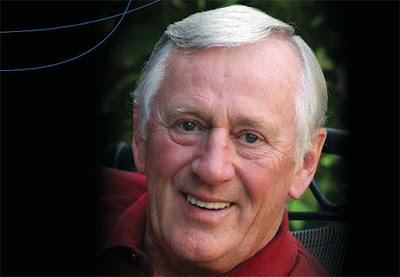 Len Cariou (pictured above) isn't a familiar name to me, but his face and body of work certainly are. The Winnipegger from St. Boniface played Sweeney Todd in the original Broadway cast of Sweeney Todd: The Demon Barber of Fleet Street. I recognize him from his many appearances on numerous TV series, including Murder She Wrote and more recently as Louis Tobin in Damages. He's currently on the CBS series Bluebloods, portraying Frank Reagan, a retired police commissioner and the patriarch of the family (including father to Tom Selleck, even though the 72-year old is only five years older than the former Magnum P-I star.). What a thrill it will be to hear Len Cariou sing Sondheim on a Sunday afternoon! Manitoba's only Tony Award winner is starring in WSO's new show, Send in the Clowns: The Music of Stephen Sondheim Starring Len Cariou, featuring Sondheim's classic music, including original Broadway arrangements from Sweeney Todd, Follies and A Little Night Music. Cariou will be accompanied by a cast of singers from Winnipeg's Dry Cold Productions, and the show with be interspersed with Cariou's stories and insights. Richard Lee is the conductor. Send in the Clowns: The Music of Stephen Sondheim Starring Len Cariou runs Nov. 4-6, 2011 at Winnipeg Symphony Orchestra's Centennial Concert Hall.